Mr. Foote founded the Constituency for Africa (CFA) in 1990, in order to establish a network of organizations, groups and individuals committed to the progress and empowerment of Africa and African people worldwide. CFA’s mission is to build public and private support for Africa, and to help shape a progressive U.S. policy towards Africa. 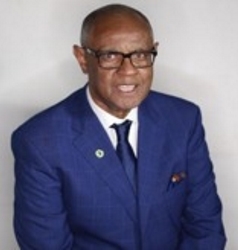 Mr. Foote is also the founder of a dynamic CFA-related program called the African American Unity Caucus (AAUC). The AAUC is a broad-based coalition of African-American and African leaders of Africa-focused organizations and groups, to promote pan-Africanism and to link Diaspora leaders in the Western Hemisphere with the African Union (AU), the coordinating forum of the nations of Africa. Further, Mr. Foote serves as an advisor to the African Union’s Ambassador to Washington and as a consultant to the World Bank on African Diaspora issues. Mr. Foote has participated in numerous high-level missions to Africa, including as a participant on a White House delegation to assess the genocide in Rwanda in 1994; as part of a high profiled team that sought to end the war between Ethiopia and Eritrea in 1998; as a member of a Presidential mission to five African countries in 1998 to promote U.S. trade with Africa and the African Growth and Opportunity Act; as the leader of a mission to reach a comprehensive peace agreement in Sudan in 2001; and as the leader of a delegation to South Africa in 2003 to assess the New Partnership for African Development (NEPAD), a continent-wide initiative to promote economic integration and development. Mr. Foote is the recipient of numerous awards and recognitions that include the “Order of the Lion” Award in 1998, which is the highest public service honor of the Government of Senegal, and the Congressional Black Caucus 2001 Annual Legislative Conference’s Diggs Award for Foreign Affairs in recognition of his outstanding commitment and achievement on issues and concerns pertaining to Africa. Mr. Foote is a regularly requested speaker on radio and television as well as a prolific writer of articles and editorials featured in newspapers and magazines across America. Prior to founding CFA, Foote served as a U.S. Peace Corps Volunteer and teacher in Ethiopia and Eritrea from 1973-1976. From 1981-1984, he served as Africare’s Representative in Somalia. From 1984-1994, Mr. Foote worked in Africare’s Washington headquarters as their Director of Constituency Development, which led to the founding of CFA.